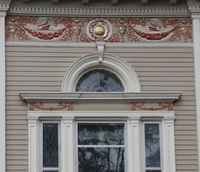 The Noyes House is one of the earliest Colonial Revival houses in St. Paul. [Irish-1999 p 22, quoting Murphy-1979] Eighteenth-century colonial details combine in a fashion that could only happen at the end of the nineteenth century. Although there are bits of color in the main stairway windows, particularly important is the use of clear leaded glass. Derived from the austerity of American colonial architecture, the use of clear leaded-glass windows is a feature common to Gilbert & Taylor's houses. The location of the front door is another example of the firm's whimsy. The porch is centered on the symmetrical front facade, but the door is not. Charles P. Noyes, one of the partners in a Saint Paul pharmaceutical company, Noyes Brothers and Cutler, was a longtime Summit Avenue resident. 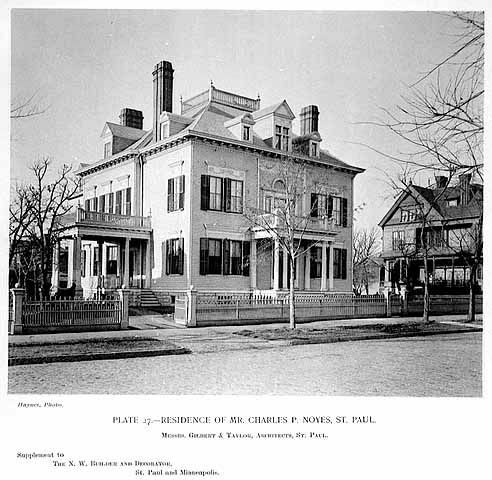 He built a house at 235 Summit Avenue in 1878 and later moved to 294 Summit Avenue. He then purchased property on 85 Virginia Street, where an already existing double house stood. Noyes made improvements to the house and occupied it during the construction of his new house next door at 89 Virginia Street. The carriage house was located behind the existing house. The carriage house cost $3,000, the house, $20,000. The double house was later razed. The carriage house, too, has been razed. The Colonial Revival design is most appropriate for Noyes. The Noyes' ancestral home, the "Old Noyes House" in Newbury, Massachusetts, dates from the 1630s. [St. Paul, History and Progress: Principal Men and Institutions (St. Paul: The Pioneer Press Co. 1897) 87.] 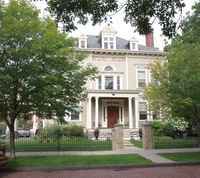 Newbury was a destination of the widely publicized field trip in 1877 taken by architects McKim, Mead, White, and Bigelow to explore the roots of New England architecture and subsequently provided the basis for the introduction of Colonial Revival architecture.